The failure so far to curtail the extremist Bodu Bala Sena (BBS) activities against the Muslim community is a major black mark on the Yahapalana government as it promised to bring peace and reconciliation to the country. It is understood that people’s racial attitudes, hatred or prejudices cannot easily be eliminated just because of a governmental change after an election. However, it is the bounden duty of any government to curtail open extremist activities, spreading hate and incitement against communities. This is more so in the case of a government elected on the promise of good governance, rule of law and justice to all communities and particularly to the vulnerable minorities. What Galagoda Aththe Gnanasara has demonstrated at the Satyagraha meeting at Mahiyangana on the 21st of this month is not simply expressing his views. It does not cover under the freedom of expression. It is a clear incitement against the Muslim community and a challenge to the rule of law and the law enforcement authorities. He should have been already arrested and brought before the law of the country. His hate against the Muslim community in this instance is very clear. It has been clear even before and throughout his ‘political career.’ He is simply not a proper Buddhist monk in my opinion but a political activist with extremist views and intensions bordering on a fascist ideology and intent. Gnanasara is always an emotionally charged person often with the use of filthy language. These are clear signs of a fascist lineage. It is typical of a fascist propagandist to lie, distort or make a mountain out of a molehill. He has said “First they threw rotten eggs at our teachers in Madawala, and then they tried to build a mosque which was taller than the height of the Dalada Maligawa.” Who has given him the sole authority to speak on behalf of the Sinhala people or the Buddhists? Even if he has genuine concerns about the said incidents (which I doubt/dispute), threatening the Muslim community in general is not the way to resolve a dispute. The foremost place for Buddhism cannot be the height of the Dalada Maligawa! Most alarming is his threat to enact the ‘phase two of Aluthgama.’ This is where his violent and fascist intent is very clear. 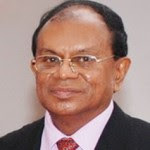 After referring to possible ‘intelligence officers’ listening to his speech he said, “go and tell the authorities that if they don’t give a solution to what we demand, we will launch the phase two of Aluthgama.” The demand he placed was to release the two young persons in remand who had apparently intimidated the Muslim businesses in the area to close down their shops during a protest. The said protest had apparently organized because of the ‘pulling down of a Buddhist flag’ by a Muslim youth which should also be condemned and consider provocative. However, this is not a recent incident but more of a pretext. In his speech, he not only attacked the Muslims but also the Tamils. In his speech, he didn’t fail to recall the ‘proverbial mother’! If anyone has concerns about the people in custody, the right place to go is the courts and not the market place. He has always opted to disregard the laws and law enforcement authorities in the country. In addition to fascism, he also demonstrates a complex strand of anarchism. He cannot simply be considered as a proper Buddhist monk. His most alarming threat of violence was against the police. Referring to the IGP, he said, “If you can’t handle them, tell us, we will take care of them. We only need about 50 people to take care of them, and we are not scared to go behind bars.” He was referring to the Mahiyangana police as ‘them’ and clearly threatening mob violence as he admitted it would place them behind bars. However, such a threat is sufficient enough to arrest him as a precaution and charge him against incitement. 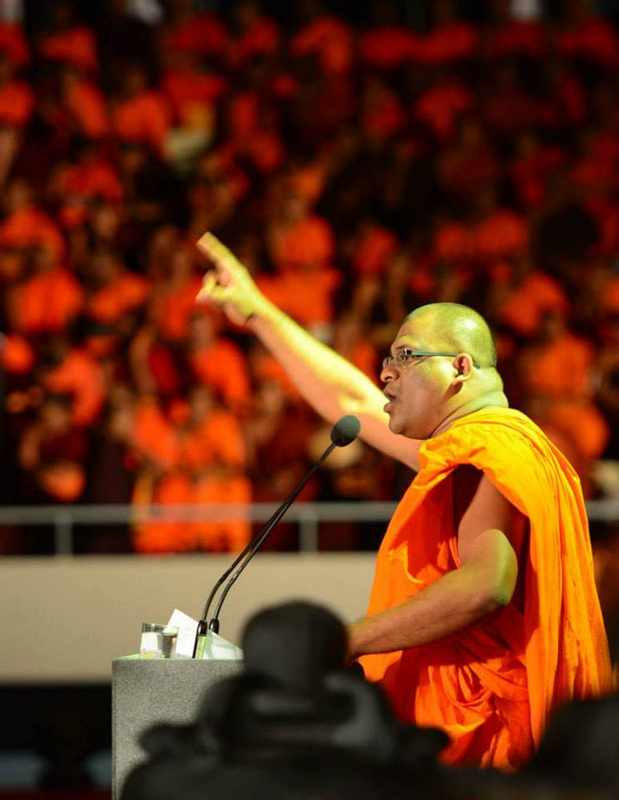 Gnanasara’s outburst, violence or fascism should not be a reason to condemn all Buddhist monks. He is in saffron robes, but he is not a proper Buddhist monk in my opinion. What is alarming however is he is flanked by several other ‘Buddhist monks,’ with or without knowing the gravity of what they do or utter. This is a matter to be untangled preferably within the Buddhist Sangha themselves. It is also apparent that Gnanasara is exploiting business enmities between different communities to promote his fascist cause and in this case at Mahiyangana. It is not unusual for the clergy of different religions or denominations to get involved in politics, extremist movements or even fascism. However, this cannot be considered ‘healthy for religion or for politics.’ Particularly in Hungary during the rise of Fascism in 1930s, there were numerous Catholic priests who went behind Szalasi’s movement. Ference Szalasi was the leader of the Arrow Cross Party which was responsible for the killing and mayhem of thousands of Jews. This is just an example. This is also the case today of many Imams and other Islamic religious leaders supporting the Islamic State of Iraq and Syria (ISIS). However, there are many other Imam’s and leaders condemning or distancing themselves from ISIS. Sri Lanka is fortunate to have moderate or ‘Abangan’ Islamic believers and the government or the public should be mindful of not to push the youngsters to the extremes like in some Western countries which could create a virtual hell as a result of these religious polarizations. That is one reason why lawful action should be taken forthwith against Gnanasara and his gang. However, in recent times this has changed again. A good number of Buddhist monks are now involved in various social causes like human rights and peace. However, there are no organizations such as the BBS or the 969 Movement of Ashin Wirathu in Mynamar (Burma). This is despite the presence of numerous Cham Muslims or minority Vietnamese in Cambodia. Still the Cambodian Buddhist Supreme Patriarchs hold the moral authority to refrain their respective member monks getting involved in extremist politics or unacceptable ventures contrary to the Buddhist principles. This is part of the Sangha Vinaya (discipline) fairly maintained in Cambodia. I am not at all advocating a constitutional prohibition of Buddhist monks or other priests getting involved in politics like in pre-1975 Cambodia. However, there should be some constraints within all religions or religious denominations of their clergy men or women getting involved in politics or extremist politics. The case of Gnanasara however is different. He is obviously a potential fascist, who can derail all the good intentions of reconciliation and peace in the country. He is apparently a law breaker and inciter who should be brought before the law. “The ISIS however is not the solution but the exacerbation of the problem,” he emphasized. The reason he gave was very common to Buddhism, Christianity or Islam: “hatred begets hatred” (Wairayen Wairaya Nosan Sinde). This is why the rule of law should be administered, for Gnanasara or any other perpetrators, without any hatred or vengeance.